Prospecting for gold with a metal detector is one of the most challenging and rewarding ways to search for gold. The highly mineralized ground associated with most goldfields, along with trashy iron rubbish and the overall rarity of detectable sized gold nuggets makes finding with a metal detector a serious challenge. 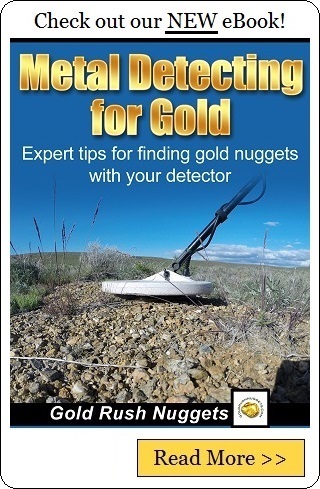 Many of the most successful gold detectorists will tell you that it took significant trial-and-error before they became proficient at finding nuggets with a metal detector. In fact, it is not uncommon for even a determined beginner to take several years before they find their first nugget. There is really no big secret that makes someone a successful nugget shooter. Hard work and determination are the real “secret” to success in gold prospecting. Nonetheless, there are a few tips that will help shorten the learning curve, and might help you find that first nugget. There are hundreds of different metal detectors on the market, and almost ALL of them will perform poorly for gold prospecting. Detectors that are designed for finding coins and relics rarely work well for gold. If you are serious about finding gold nuggets with a metal detector , then get a detector that is specifically designed for hunting for gold. One of the biggest challenges associated with gold detecting is the highly mineralized ground found in most goldfields. It will cause your metal detector to operate very noisy and erratically. In order to hear a gold nugget amongst all the other sounds that this mineralized ground can cause, it is important to ground balance your detector to tune out these other sounds. Each gold detector will have its own method for ground balancing. Learn how to do it properly. This one seems so simple, but it is amazing how often beginners overlook this critical step. The operator’s manual is the most important “accessory” that comes with your detector. Learn all the features of your detector and how it works inside and out. This will help you shorten your learning curve significantly. Many goldfields are absolutely littered with iron rubbish; rusty nails, boot tacks, bullets, old cans, miscellaneous iron fragments, etc. There may be hundreds or even thousands of iron trash targets for every piece of detectable gold. This can seem overwhelming for a beginner (and even experienced) detectorists. It can be easy to get lazy and start depending too much on your detectors discrimination features so that you don’t have to dig so many holes. At first, you should really dig every target, regardless of what it sounds like or what you think it might be. Learn the sounds that your detector makes before trying to pass over targets. As you gain experience with your detector you can start to reevaluate what targets are worth digging and which ones aren’t. Most metal detectors have several different shapes and sizes of search coils that can be used on each detector. Depending on the area that you are prospecting, different types of search coils should be used. Mono coils will generally locate targets deeper than DD coils, but will not discriminate targets in the same ways. Larger coils are ideal for finding larger, deeper nuggets in areas that have been hunted by previous detectorists, but sometimes a smaller coil will operate more smoothly in highly mineralized ground. Don’t be afraid to experiment with different coils in different areas. Most gold nuggets are small and give off a subtle target sound. 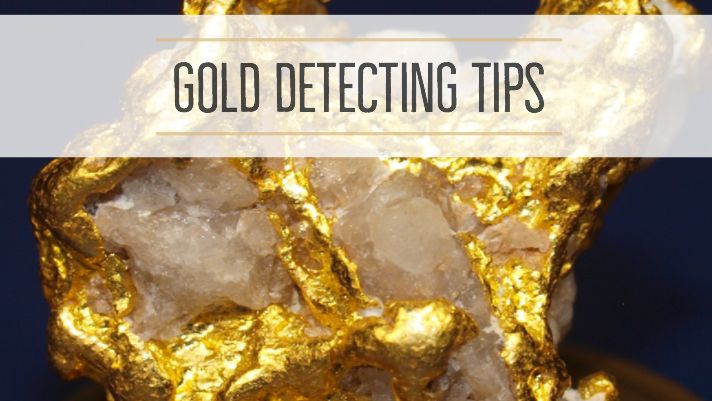 Swinging your detector too quickly will increase ground noise and mask the sound of a gold nugget. Keep your search coil close to the ground and slow down your speed to increase the chances of hearing a nugget. The subtle sound of a gold nugget is easy to miss. Using a quality pair of headphones can help you focus on the sounds of your metal detector rather than the sound of airplanes, wind, traffic, birds, and anything else that might distract you. Even the best nugget hunters dig a lot of targets in a day of metal detecting, the majority of which is iron trash targets. A significant part of your day is digging targets rather than detecting. Use a quality digging tool and focus on speeding up your target recovery speed. The quicker you can dig a target, the quicker you can move on and continue detecting. Detecting for gold is not easy. You will often find yourself climbing up steep hills, pushing through brush, getting scratched up and cut by cactus, hot sun, mosquitos and other pests, and all kind of stuff that you experience out in the field. These things can cause you to lose focus and detect sloppily. Make sure you are will prepared with sunscreen and bug spray, and make sure you have plenty of food and water with you. Don’t carry more equipment than you need for the day. Travel as light as you can and try to stay comfortable. This will help you to stay focused while you are detecting throughout the day. If you notice that you are getting sloppy with your detecting technique, take a short break, find some shade and have a snack and some water. This will help reset your mind back into “prospecting mode”. Yep, this is the real “secret” to successfully finding gold with a metal detector. You have to tell yourself that there is gold out there and that you are going to find it. You need to accept the fact that even highly successful gold hunters have days when they don’t find anything. Stay motivated and tell yourself that the next target you dig will be a nice gold nugget. Guess what… sooner or later you will be right!